It’s very clear that people who cycle in Belfast do not want 4,000+ taxis to hassle them in bus lanes. But the elephant in the room in this debate is sizeable – a £100m elephant in the shape of the forthcoming Bus Rapid Transit system. Now that we know just how wrong the public consultation on bus lanes was, isn’t it time to re-evaluate the effect on the largest group of bus lane users – bus passengers? Image owned by RobertG and is licensed for reuse under the GNU Free Documentation License version 1.2. See this image’s original location on Wikipedia Commons. 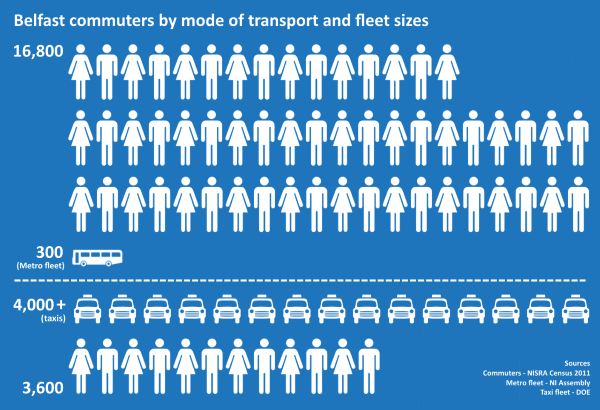 Bus transit was chosen over light rail/tram due to cost and flexibility (among other factors) but one thing that stands out about the Belfast system is that it will be almost exclusively on-road, sharing space with general traffic. Many BRT systems around the world use dedicated (even guided) running tracks, giving the system a guaranteed time advantage over general traffic. So what is the purpose of a bus lane? BRT will naturally target a wider audience through the day, but with vehicles planned to be 18 metre articulated buses with a capacity of around 100 people, and all of the infrastructure works and heavy promotion expected, the number of bus commuters in Belfast should grow. So what will 15 taxis for every Metro bus do to average journey times in Belfast, and the future Rapid Transit system? It’s a sensible assessment – taxis allowed in bus lanes will be stopping to collect passengers (BRT’s East and West routes run along mixed residential and commercial streets), stopping to drop off passengers while settling fares, and there will be an increased weight of bus lane traffic queued at junctions. Regardless of this, DRD ploughed ahead with their option to allow all taxis into bus lanes, prioritising taxi customers to the disadvantage of bus passengers and inexplicably gifting the taxi sector a competitive advantage over Bus Rapid Transit. 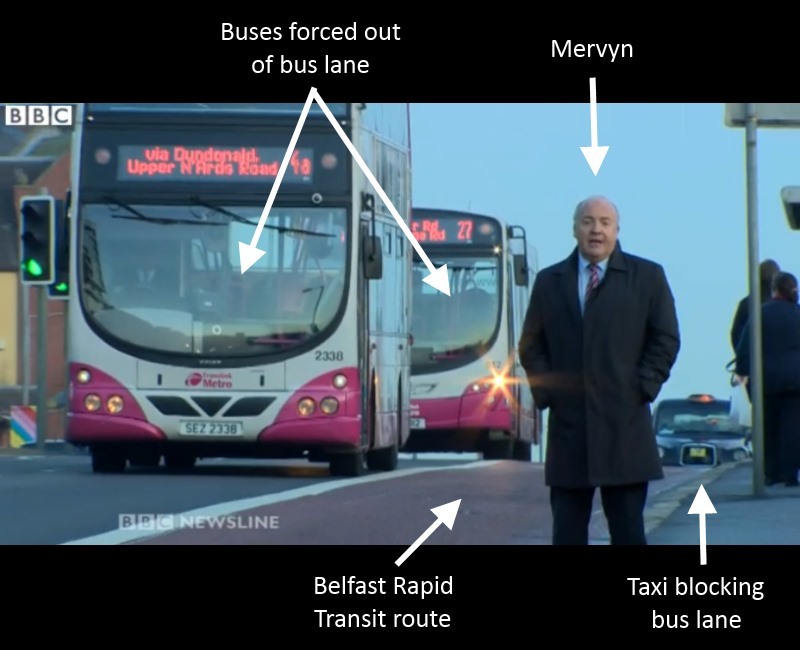 And remember, this is based on the assumption of just 2,000 taxis being allowed in Belfast bus lanes..
You got to know when to hold ’em, know when to fold ’em..
No reference was made to Belfast Rapid Transit in the DRD consultation. No reference was made to similar BRT systems operating in shared space with a significant taxi fleet. No care seems to be given to bus passengers’ journey times and the overall aims of providing a compelling “alternative to private car use”. Just as with the concerns for cycling, DRD seems oddly happy to make a blind raise on bus lane access for thousands of taxis to solve an immediate problem, while gleefully ignoring any long-term negative impacts. The consultation process does not stand up to serious scrutiny; Belfast taxi fleet numbers assessment only told half the story. The sensible move, given the level of public investment in BRT at this time of austerity, would be to shelve the plan to allow all taxis into bus lanes until BRT has a number of years to bed in. Potential impacts of sharing space with taxis can be assessed in real-time, based on a retaining the hackney cab/wheelchair accessible fleet to operate in bus lanes alongside BRT. Judging by the reaction to every challenge to their consultation process (during and after) Departmental officials clearly don’t see an issue here. DRD are showing a remarkable poker face, given the incredibly weak hand they’re holding. But who can call their bluff?